The clouds were moving slowly, there were no sounds of birds chirping, the wind was whispering a sad song, the tone was just gloomy. It was quiet, except for the nostalgic sound of droplets from the rain outside. Somewhere in the cold cold London, sat two people with their laptops on but with no smiles on their faces. BECAUSE THERE’S NO FREAKING WIFI IN THIS HOUSE. I’m in London now with Dean (hello, British people!) for a work trip. We’re here for several reasons; dUCk’s first tradeshow in Pure London, dUCk’s event in Fortnum & Mason (as posh as the Queen, don’t mind us with our scones and tea…), meeting Muslim bloggers here, meeting our tech partner for FashionValet here to discuss some issues, Dean is giving a talk in his old uni Imperial College, and also shooting for Love, Vivy Season 2. While the teams cozy up in their nice Airbnb with nice clean sheets and WORKING WIFI (lucky cows), I’m in my old apartment. I love this place so much, I miss it so much, brought so many good memories of my uni days where I had full wifi coverage. No one stays there now so we disconnected our internet plan, and boy…. I regret that so much. I’ve been hot spotting to my laptop to watch Netflix and my phone is barred now. We’re considering sitting in a cafe to get wifi but it’s soooo cold outside that I’d rather eat vegetables than freeze to death. I’ve been trying to steal my neighbour’s wifi so many times, guessing all sorts of passwords, but to no avail. Dang that lock icon next to their WIFI names. WHY SO KEDEKUT WANNNN. I JUST WANT TO CHECK MY EMAIL, GO ON FASHIONVALE AND CONNECT TO THE REST OF THE WORLD. PLEASE GIVE ME YOUR PASSWORD OR I MIGHT GO CRAZY. Guys, do you notice how gloomy the skies are in London? I swear without wifi connection, the clouds look so much grey-er. We also disconnected Stevie the TV, so literally, Dean and I only looked at each other and the walls, the whole time. The wall, mostly. We’ve talked, we’ve eaten oranges, we’ve napped, we’ve talked some more, we’ve argued, we’ve finished all the cookies… Soon we’ll be braiding each other’s hair and painting each other’s nails. You know those scenes in movies where freaky people stand at their windows without moving and just watch people passing by… they’re not dangerous, guys, their wifi is just broken. So, if you happen to be BT6057 or Skynet36 or dontstealmywifi reading my blog by any chance, could you be a good neighbour and kindly unlock your wifi? hahaha i was laughing reading this 😀 hope you’ll find your wifi soon, vivy. I love your blog vivy! you’re such an inspiration to me! ok, this is funny. but hey, at least you are not alone, Dean is with you. LOL. Maybe invest in portable wifi router? I believe most airport provide portable wifi router for rent. This is your first post that I read and honestly, my heart was breaking slowly reading the first paragraph because I hated such melodramatic things and when I realize what you were doing, it fits like puzzle pieces. Loved it that you tried to guess their pw. Nice read :). I have been following your instagram for like a month or 2 now. You are an inspiration to all the ladies out there. Keep inspiring us and I do hope you can maintain this many followers for many many years ahead :). 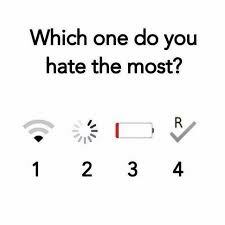 I HATE THREE THE MOST. no joke.